Hello everyone and welcome to my first mapping project on Project Zomboid. 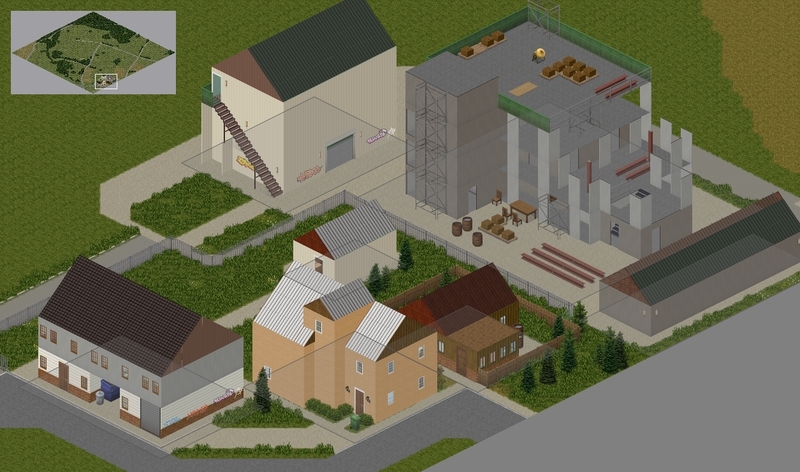 I will be attempting to replicate the current Chernarus+ map into Project Zomboid for you to enjoy. Now, I am currently working with the basic tiles and items without anything custom added, and it may be a while this way since I don't have much knowledge into creating custom tiles, furniture, etc. So, I will try to get as close as I can to the actual DayZ/ArmA map. Keep in mind that there will be differences and issues and bugs and so forth, but that is why I hope I can make a releasable edition soon for all of you to at least test if you are willing to. 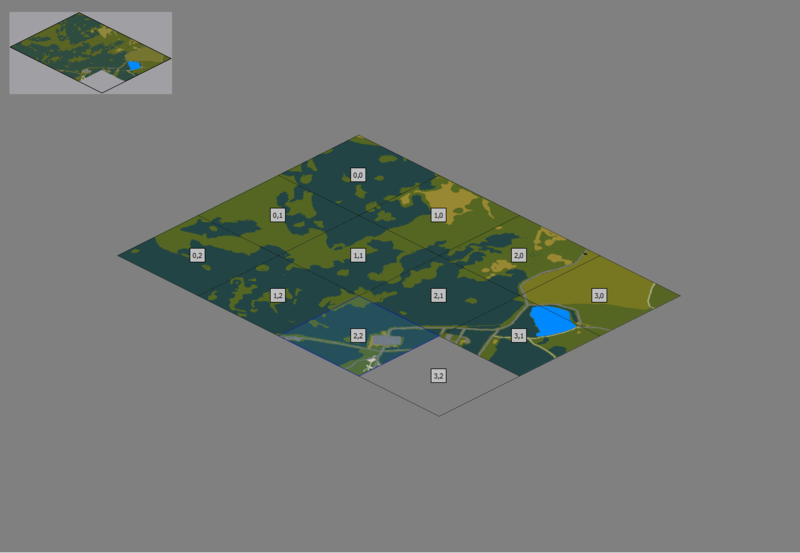 I am basing the map on 500mx500m cubes taken out of the dayzdb map online and slowly re-doing them in photoshop to use them in WorldEd. If you wish to contribute or help out, whether that is improving or making tiles, making custom buildings based on the Chernarus/DayZ ones, even custom textures if you can, as well as any suggestions, tips or anything I am willing to accept it. You can help out either by posting in the comments or contacting me via PM and I can get you involved in this current one-man team job and of course you will get credit for your work (No money, is Eastern European, never people was rich here, very sorry, I run this on stolen Soviet PC). Either way I will accept comments of any kind, hope you guys like it! The map's size will be increased by two, meaning that the map will end up being 30x30 cells most likely (Unless I run into problems). The majority of the already made 3x3 area is already recreated into a 6x6. 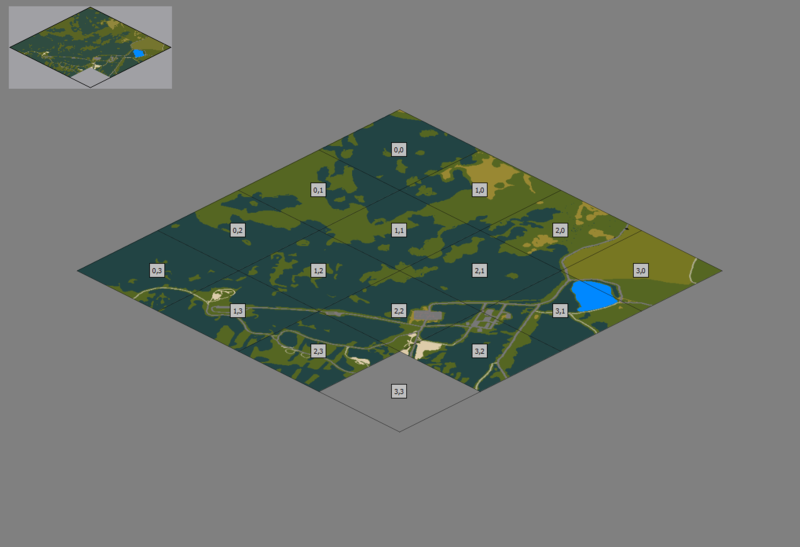 I am currently taking 500x500m cells out of the DayZ map and making them into 300x300m in the Project Zomboid map itself. Expect some pictures and perhaps a more detailed update soon. Progress is a tiny bit slower then usual but I am paying more attention to detail now that the map became twice the size then it originally was, however here's a screenshot of the fully completed tiles so far. Many more are in the process of editing and should be up soon. Once cell is only 300 meters square. So for a 15000 meter map you would need a map 50 cells to the side. I know the cells in the game itself are 300m2, however I used the measurement of a cell being 1km by 1km when copying the map, do you reckon the map itself won't fit? Because I'd much rather resize them immediately rather then later. Same as above, what is your opinion on the map, will it fit or should I immediately resize it? And to both of you thank you for your input, however after working on it for a little bit right now I think a resize might be necessary in order to fit in all the buildings and such. But I'd like to hear from the rest as I don't have that much experience... yet. 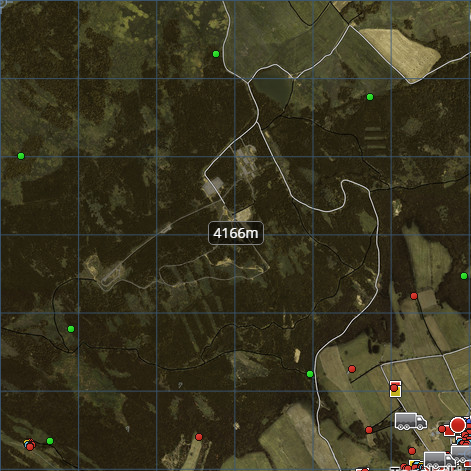 of course if you want an 1:1 100% accurate recreation of chernarus youll have to make 1000mx1000m in PZ correspond to 1000mx1000m in arma 2's map. otherwise, the smaller ur tilezed dimensions are opposed to arma 2's the tinier the map will feel, such as small forests that are the size of like 3 buildings. but it doesnt seem like you do so 500x500m cells in 300x300m PZ sounds extremely great actually. Yeah I won't create a 1:1 for the sake of copying the map, considering DayZDB already splits the map into 100x100, 500x500, 1000x1000 meters, 500x500 seems like a good middle-ground and it's already marked out on the map, which makes my job about a 1000 times easier then measuring 300x300 meters constantly and especially trying to find where I left of after I sleep or something. My only fear is the buildings and the city however, as I am starting the map from the top-left corner, since it seems like every time I resize the world it expands to the bottom and left, and the map there is just mainly forests and empty roads filled with nothing, so judging the scale is pretty hard. And of course I do have a tiny problem of I can't fully copy all the Chernarus buildings since I only have American walls and textures to use. 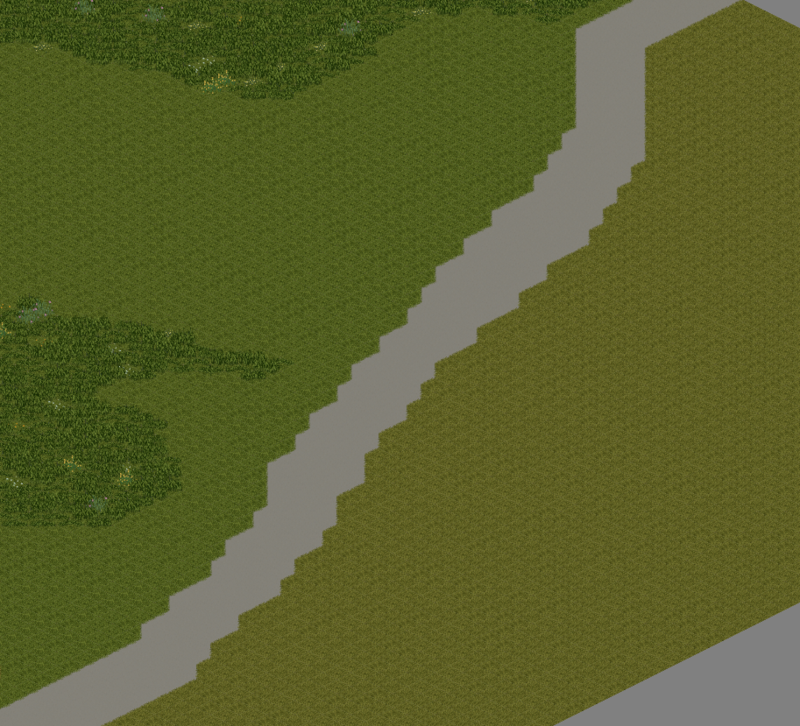 And Project Zomboid does hate curvy roads so. As you can see below, kind of an ugly scene to look at, so yeah if you or anyone else has any advice on this little problem that'd be great. But either way thanks for the tips! Not sure what youre working with but in PS it was just a matter of grabbing the selection expanding and contracting and smoothing. But because I'm not working on a replica i could make my streets however id like, meaning a lot less curvature. Might i suggest taking some artistic liberties and changing the streets to be straighter, especially if those streets dont have buildings nearby. Itll keep things clean. Yeah, replicating does tend to make things slightly more complicated, in the wilderness I have all the artistic liberties I need to fix the roads, and these roads are usually broken in ArmA as well so it's easy for me to create a jagged broken look with the light and dark pothole textures and just make things look realistic and clean. Unfortunately the problem does tend to be in the towns, it's hard to make it look smooth, especially if the house is meant to lay on the road at an awkward angle, but I am doing my best, and a little bit of light in my troubles is that most buildings and roads in Chernogorsk and other cities, when looking at the map will be easy to make, as they are usually perfectly going straight in most cases.